DETROIT – Saying the labor movement has become too small and too inward-looking to defeat corporate power by itself, AFL-CIO President Richard Trumka told the Auto Workers legislative conference that unions must build wider coalitions to achieve their legislative and political goals. 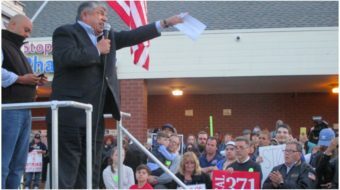 Trumka was one of a parade of speakers at the Jan. 17-20 confab to emphasize the coalition-building theme. Others included new Service Employees President Mary Kay Henry, House Democratic Leader Nancy Pelosi, D-Calif., and pro-worker analysts such as Thea Lee of the AFL-CIO and Larry Mishel of the Economic Policy Institute. Speakers also laid out the goals such coalitions should aim for. 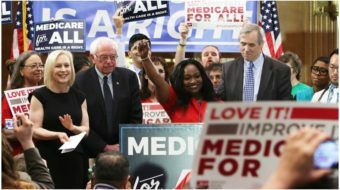 They include restoring the middle class, preserving health insurance reform unions helped push through the last Congress, and the right to organize. But Trumka was the bluntest about admitting labor’s weakness, decrying corporate power and suggesting what to do about it, in his Jan. 18 speech. “After the year we’ve just had – and with the year we’re facing – we have to be broader and stronger,” he said, referring to successful GOP blockades of pro-worker legislation in the last Congress and the GOP House sweep in last fall’s election. Despite “I-don’t-know-how-many phone calls,” letters, marches and rallies that “pushed and prodded Congress to pass historic health care reform-and Wall Street reform,” corporate America fought back tooth and nail, and won in the election, Trumka said. He said the Chamber of Commerce alone spent more than $150 million. Despite labor’s mobilization – a mobilization Trumka took pride in – the corporate interests won, and will use their new power, in Washington and the statehouses not just to defeat the union movement, but to destroy it, he said. So labor must look at itself in considering how to combat the corporate aggression. We’re not as big as we used to be; our corporate opponents are bigger and we’ve become too insular – too inward-looking,” Trumka said. “So we’ve got to look honestly at ourselves, at the roles we play in our communities, at what’s happening to all working people, and we have to ask ourselves: What more can we do to build the America we want to be? We have to reach out and solidify new strength in numbers. “We have to build alliances and real partnerships with brothers and sisters in other unions, with members of our communities, with small businesses, with the faith community, with anyone else who shares our collective values and is willing to work for them,” he declared. Delegates, by and large agreed with Trumka. “The economy matters and politics matter, and there is a need for our union and working people to all stick together,” delegate Becky Ervin of the UAW’s Local 160 said. “Here we heard the truth – not like on TV when you only hear part of the story. That’s enough to inspire all of us to work together,” said Dereck Moczulski, another delegate. Henry said such coalition building to “fuse labor and social justice causes” will get media notice – and hostility from labor’s foes. But it will also be key in the run-up to the 2012 election, she said. Pelosi urged the delegates to push preservation of health insurance reform as they lobbied lawmakers and when they returned home to build coalitions. Her address came just before the newly GOP-run House passed a two-page bill repealing health insurance reform on a virtually party-line 245-189 vote. Three conservative Southern Democrats, who voted against health insurance reform in the last Congress, voted for repeal, as did all Republicans. Preserving the health insurance reform was one of six legislative topics the 1,000 UAW delegates discussed with lawmakers. Others included: Job creation by investing in infrastructure, strengthening the right to organize, and creating a $75 billion state and local jobs program; rejection of Social Security cuts; creation of one national standard for fuel economy and greenhouse gas emissions so auto makers and workers can successfully re-tool and re-engineer cars; comprehensive immigration reform, and; passage of the reworked U.S.-Korea Free Trade Agreement, which UAW and UFCW back and the Steelworkers, CWA and other unions, plus the AFL-CIO, still oppose.